It was another formal affair for Kate and William tonight, they were guests of honor at the Greatest Team Rises event, something of an official launch party for Team GB and ParalympicsGB, marking the final countdown to the Games. The Duchess returned to a favorite designer for tonight’s gown, Jenny Packham. Once royal journalists tweeted word that Kate was wearing Jenny Packham, the brilliant Anna of My Small Obsessions rapidly discovered the dress Kate’s was modeled after. Kate is in a bespoke version of Jenny Packham’s ‘Aspen’ gown, a design showcasing beautiful silk chiffon, light and lacy cap sleeves and an ornately embellished waist. All the design traits combine for a knockout dress, this one is a head-turner. We see another angle from the always wonderful David Wilkinson of CNN, he shared this image as Kate and William arrived. The back of the dress is exquisite, arguably prettier than the front. The style combines an emerald lace bodice embellished with Swarovski crystals and a pleated skirt, ribbon waisted with a crystal and flower embellishment and matching bespoke clutch bag. Here we zoom in a bit to better show the stunning lace and shimmering crystals. That image also shoes Kate’s elaborate updo of multiple braided sections. 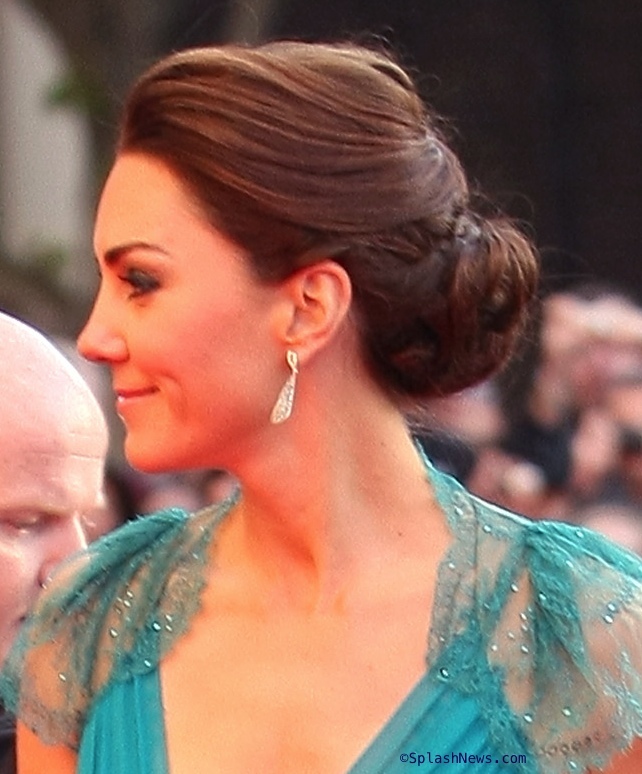 Below you can see a side angle of the style, as well as what appear to be new earrings for Kate, rhinestone or diamond-set dangles. The dress is lovely, here we see it in a photo spread at Miss Bush Bridal Wear. Below we have another look at on model Ally Murray, she actually tweeted her delight in wearing the dress. The MSRP on the Aspen gown was £2875, approximately $4620 USD at today’s exchange rates. Kate carried a matching clutch in the same silk and lace, she also sported the glittering Jimmy Choo Vamp dress sandals. The shoes remain available on the Jimmy Choo website and also at Nordstrom. Guests signed messages of support for Olympic and Paralympic athletes on their way in to the event, below we see 5-time Olympic rower Sir Steve Redgrave writing well wishes, with thanks once again to CNN’s David Wilkinson for sharing his wonderful photos. Five-time gold medal-winning rower Sir Steve Redgrave escorted Kate into dinner, which included free-range chicken, lightly smoked ham-hock terrine, slowly braised British beef on spring cabbage and pancetta, and bitter chocolate mousse on shortbread, accompanied by passion fruit yogurt and freeze-dried mango and coconut. 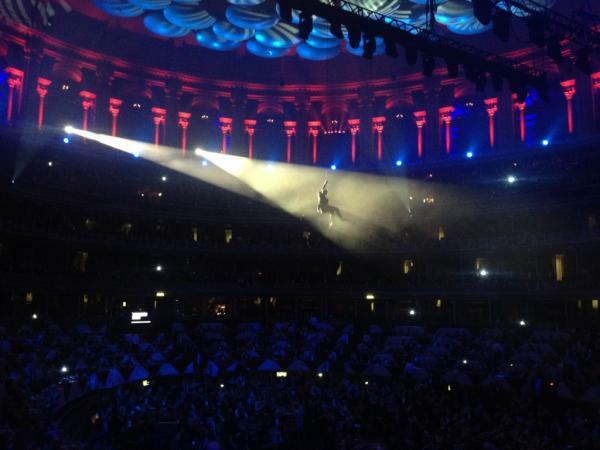 Tonight saw the first performance of “One Vision,” the official Team GB and ParalympicsGB song, as well as other excitement, including adventurer/survivalist Bear Grylls making an aerial entry. 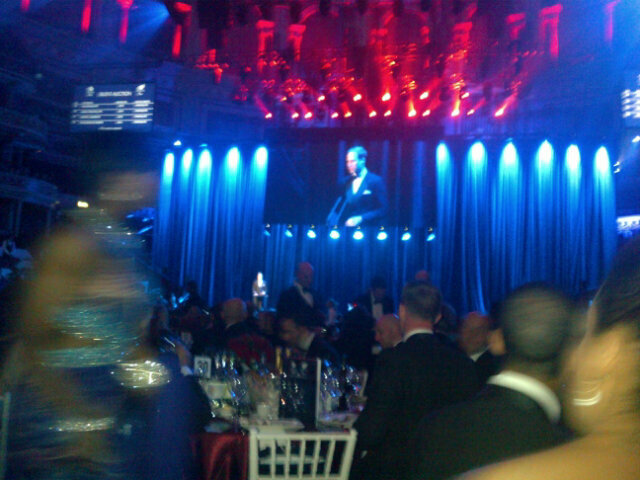 William addressed the crowd before dinner, Hello! magazine editor Rosie Nixon posted this photo. Paul Harrison of Sky News shared some of William’s remarks via Twitter. This was an outstanding look for Kate, the gown offers a level of sophistication that very much suited her. The rich teal or turquoise (the jury is out on the precise color) enhanced Kate’s coloring, while the sheer elements of the frock provided a little va-va-voom without being inappropriate. The Duchess oozed elegance without being overpowering, a very tough combination to pull off. As A Petite Princess pointed out, this is the second time we know that Kate has chosen a designer’s bridal gown for a formal event, Kate wore a bespoke version of a Temperley bridal dress to the War Horse premiere (more on that here) in January. The Telegraph’s story is here, Daily Mail’s story on the event may be found here, and a nice ITV video piece is here. The BBC’s story is here. Rebecca reports the date hasn’t yet been disclosed because of security reasons. As soon as we know when it is we’ll be sure to let you know. Also new since yesterday, photos of Kate on a camping trip with Lupo and some Scouts, PopSugar has the photos. The event is part of Kate’s volunteer work with Scouting, she sported Paige Denim’s ‘Skyline Peg’ jeans (WKW Facebook friends Kerianne identified the jeans, Ashley Margot received confirmation from Paige), Le Chameau boots and an unidentified gilet. UPDATED: Feb 2014: It turns out the vest is from UK retailer John Lewis. 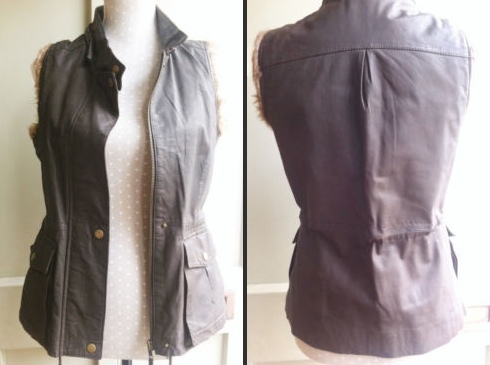 The vest is shown in an eBay auction, discovered by eBay seller CopyKate. The piece is made of brown leather, with a full front zipper, interior drawstring waist and front pockets. (The vest has long been out of stock.) I have updated the original blog post, but wanted to note this is a great reminder for me: even retailers and designers can be mistaken in claiming an item is theirs, as in this instance. 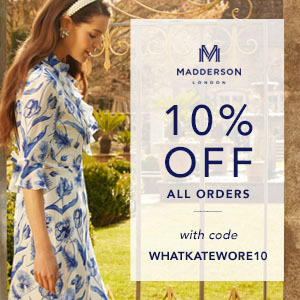 Sign up for Shop It To Me (either at ShopItToMe.com or ShopItToMe.co.uk). Leave a comment on this post telling us your favorite Kate-inspired clothing brand. For an extra entry, tweet this and let us know you did: Hope I win the @WhatKateWore @ShopItToMe $500 Kate Middleton-inspired shopping spree! To enter, RT and visit http://bit.ly/JerRED. 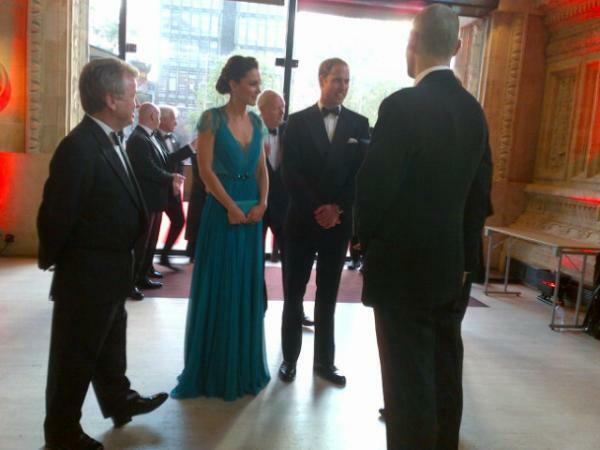 For the copy Kate’s I just stumbled across this version of her teal Jenny Packham dress. Not exactly the same, but almost there! First, I LOVE this blog!!! Thanks so much for your hard work!!! Does anyone know where you can buy the boot socks (or similar ones) that Kate is wearing in the scout camping photos? I have similar high rubber boots to the ones Kate is wearing in the photos, and the regular sized socks I wear with them always get bunched up and work their way off my foot while still in the boot. These boot length socks would be perfect for me! AND they’re SO CUTE!!! Thanks in advance for the WKW crew for their help!!! I love this dress on Kate. The colour is great and the detail on the back…. wow! She looked absolutely stunning! I just saw the picture of Alexandra of Sayn-Wittgenstein-Berleburg in the red Packham dress on your FB page. It is red because of the RUBY Jubilee of Queen Margrethe and it also echoes the Danish flag, red dress and white/silvery lace. So I think this is a really nice thought of her! Thank you so much for sharing your insight, I shared the information on the FB post. It is a wonderful tribute to the occasion! I LOVE the Temperley gowns. I have also tweeted the word! I’m in LOVE with her turquoise Jenny Packham gown. I think it’s her best yet! When I saw Kate in the cream Roland Mouret I thought, “What a beautiful woman!” When I saw Kate in the teal Jenny Packham I thought, “What a beautiful dress!” I think good taste makes you notice the woman not the clothes. Nothing against the Jenny Packham dress but teal is for blondes or redheads. I think the same dress in Kelly green like the DVF dress Kate wore to Los Angeles would have been better for her coloring. And if Kate paired a Kelly green evening dress with Diana’s favorite emerald earrings (the ones Diana use to wear with Queen Mary’s emerald choker) – Wow! I also loved those Jimmy Choos with the Roland Mouret dress but I think a closed toe stiletto that matched her clutch would have been better for the Packham. I loved Kate’s first Erdem dress. Besides her wedding dress, it’s my favorite dress she’s worn. I am already a Shop It To Me member … my favorite is LK Bennett. Thanks for always posting such great stuff! Kate looks stunning! Once again i think this was not a good choice for her. I hate the color and the fit. Those shoes are not for this gown. Her makeup is too harsh and makes her look older. Something is off with the whole thing and has no WOW factor. She needs help with everthing. It’s possible I audibly cheered when I first saw this Jenny Packham – that color! the hair FINALLY up! that intricate detail on the back! no-hose Choos! I couldn’t love this more (exclamation point). I am signed up. I love all of Kate’s looks – i pin everything on pinterest. I wish she would just have her clothes go straight to my closet when she is done with them! I really love the Jenny Packham stuff. I had never heard of her before Kate started wearing and getting noticed in all her dresses. I just entered the giveaway! For casual looks I love Kate’s brands like JBrand and Zara of course. But one one of top favourites is DVF and Erdem! I am so glad to see Kate experimenting with different styles (within her limitations), bringing more of her personality in, and re-defining royal fashion. I’m getting married soon and every time Kate wears another gown, I find myself in love with another wedding gown designer. 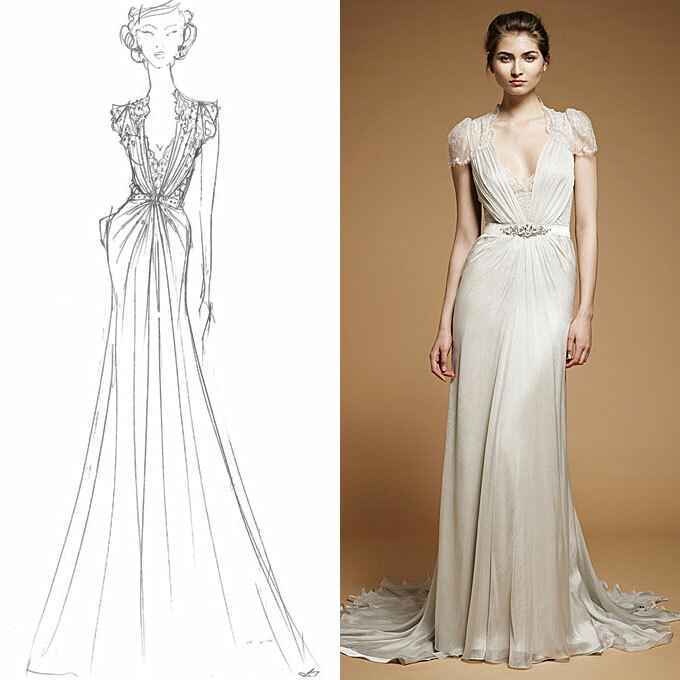 Off in search of Jenny Packham dress now — my new favorite designer inspiration. I like the dress, but what’s with the little bows at the waist on everything she wears. On one or two outfits it would be ok, but it’s enough. I know they are on trend, but…Something about this dress is trying too hard. Maybe the pleating, maybe the lace and pleating over it, maybe the cap sleeves. I can’t name it. Love the hair up. Wish the make up were more natural. With the hair up, it is so much more obviously over done. My favorite dress is still the Jenny Packham from LA. That had glamour, but just enough, and it had elegance, but just enough to still be young. I LOVE this dress on Kate, but the shoes don’t look good with the dress and are pretty awful in general. They look like shoes a teenager would wear to a dance club with a trashy mini skirt. I think she wore those shoes with beautiful evening gowns (the light purple dress she wore in the States) once or twice before and I thought the same thing. Kate’s hair looks wonderful up. It’s nice to see it pulled out of her face. A necklace might have been nice with the low neckline. I think a necklace with the lace and the pleating would have been much too much. Again, she’s a minimalist (fortunately); she doesn’t overload herself with jewelry, especially when she’s wearing a dress that goes beyond the clean, minimalist lines that she prefers in her clothes. This one does. To me it seemed obvious that I did not mean the actual Crown Jewels, but those of the royal collection which includes beautiful pieces, and not all are excessive, as can be seen in publications. Are provided by the Queen and then return to their place. For example, the bracelet worn in Los Angeles, set with earrings, also used for weddings and other events. I signed up for the Shop it to Me drawing! I absolutely love all of Kate’s looks, but especially Issa! I also posted on Twitter for the extra entry. Thank you! I hope I win! Love Jenny Packham! The lacy back to this dress is gorgeous. Loved her hair up! and the gown.. she needed some decent earrings/Necklace or bracelet..other then that she looked great..so glad she didn’t wear her hair down it would have distracted from the back of the dress. Although the lace back does boldly point out how thin she has gotten. I think Kate looks perfect in this. All that is missing is some spectacular earrings (the ones she wore looked cheap and uninspiring, sorry – bit of a let down with such a stunning dress) and a new pair of evening sandals, please? But her hair and make up were superb and as always she was absolutely beautiful and a great credit to her proud husband! I think Kate looks amazing!!! This is a little daring for her and I love it! The back and her hair pulled back is beyond gorgeous. I love her and this look so much!!! 10/10 in my books. The jewel color of this gown is perfect for the Duchess. Can see why she doesn’t wear her hair up often; like Jackie Kennedy, Kate looks better with her hair framing her face. It was an ideal hair style to show off the back of the gown though. Speaking of influences, the lace back of gown reminds me a lot of a cobalt lace gown Diana wore in the 80’s that had a similar back. The white gown last week looked strikingly like a gown wore by Carolyn Bessette Kennedy in 1998. That dress was by Versace and more outre with a zip front but the stark white, the neckline, the long sleeves and the slit were very similar. A very dramatic look for the Duchess, contrasting nicely with the romanticism of this gown. Love the dress from the back, elegant, stylish and just beautiful. However the front just looks weird and it doesn’t look as good on her as it does on the model. But, she needs to retire those shoes with the nail polish:( It just looked so tacky with this gorgeous dress. Agreed. Front of the dress is off in some way, I just can’t put my finger on it. I think she just doesn’t have the chest for that kind of a neckline… it makes her shoulders look even wider too. I do like the color of the dress, but you’re totally right, the shoes and the nail polish has to go. I thought it was off too. To large and expanse of pink with that wonderful greeny blue colour perhaps? The dress has so much going for it but the front is just not right. It needs some jewellery to offset the expanse of flesh, I think. Gorgeous back to the dress, I just love it. The hair is up too. Hurrah! It had to be to show off the detail. I really can’t understand what’s wrong with her shoes, could anyone please explain? The original design is from Jenny Packham’s wedding gown collection… I feel sorry for brides who have paid good money for this dress, now only to have Kate M. wear it – who wants to have their wedding gown be known as “a dress that Kate wore”? This is beautiful. When I first saw the lower neckline and short sleeves I thought that she should have worn her hair down, but then I saw the gorgeous back of the dress and realized why it is up. It looks like the bridal version of the dress doesn’t have the accordion style pleating at the skirt, which works well on the bridal version, but I’m glad Kate went with them to avoid any possible negligee reference. My all-time favorite evening look for Kate is the pink Jenny Packham from last year’s ARK gala but this one is tied with the black McQueen as close seconds. I’ve seen other dresses on her that I actually like better than this one and having her hair up, in my opinion, made her look older. I still think the strapless black velvet she wore for the military awards is her most stunning look to date. I’m with you on that, definitely. It was a great choice and looked just right. .. I am glad so many posters are enthusiastic about this dress/outfit! for some reason I cannot pinpoint- and, I’m surprised at myself- I do not like this exquisite dress on Kate ?! – finally, obviously, the workmanship of the lace and crystals are impeccable. I’m puzzled because there have been so many lacy-topped dresses that I have loved on Kate (not the least, her breath-stoppingly beautiful wedding dress!) and I also liked the spaghetti-strapped Amanda Wakely dress she wore when standing in for Prince Charles (at Clarence House). Pretty frock even if the outfit was ruined by those horrible shoes and earrings. As her custom is, good-looking but badly dressed! Yeah, she always has one or two things that keep the outfit from being perfect. That’s why she needs a stylist, who would step in and say no those shoes don’t work, that nail polish doesn’t work, those earrings don’t work. And also I think this dress made her look broader on top than she would have if the neckline was just a small V.
I agree , and I think that’s the secret of her success: she has HER style, a trademark. everyone is able to hire a stylist and look perfect, Hollywood divas are living on it. But few , very few women, can make a flaw an asset. That’s why we likw her: in a sense, she is one of us, only richer, more famous, married with a prince, etc …I hope she will improve herself, but remaing herself. She has her NON-style: she often choose good single items but she is not able to put them togheter stylishly. She needs a stylist or at least acquiring more taste. I think that she mixes&matches only according to colour, it’s a huge mistake. She got out of recycling clothes&co, a wise custom… but she should choose “neutral” items, suitable for various pairings. Ex: Jimmy Choo sandals, occasion evening and colour metallics? Neutral or classic http://www.jimmychoo.com/springsummer-12/gerda/invt/121gerdagll/ or http://www.jimmychoo.com/evening/india/invt/247indiaggfa/! Leave Vamp sandals to… a vamp or a soubrette! She looks good, but there is a BIG BUT. Too expensive, a custom made dress for one evening? It would be good if she uses it again and choose to dye it in another color. Sorry, that does not represent people in the UK struggling with work and money. Being an American I’m not familiar with the nuances of the royal appearances. Can you explain what you mean by doing actual work? Would that mean more appearances with charities and not for profit organizations in order to help raise awareness and funds? I do agree that this is an expensive dress, but given that her last two events were black tie affairs, I don’t think her typical high street favorites would have been an option. Also, I would point out that last nights event was a fundraiser for Team GB for which tickets were sold online and other Team GB Ambassadors attended as well. I think they wanted them there (and Will serving as a keynote speaker) to increase sales as well as the overall awareness and support for Team GB athletes. What work do you think she needs to do? Her main job is to support William and I think she does that splendidly. Considering they live a distance from London, we’ve seen her at quite a few events over the last several weeks. Other members of the royal family do the same type of events as she. Do people think Zara, who is also the Queen’s granddaughter, need to do something other than ride horses? Does Sophie do more work than Kate? I’m just trying to understand what work you want Kate to do. 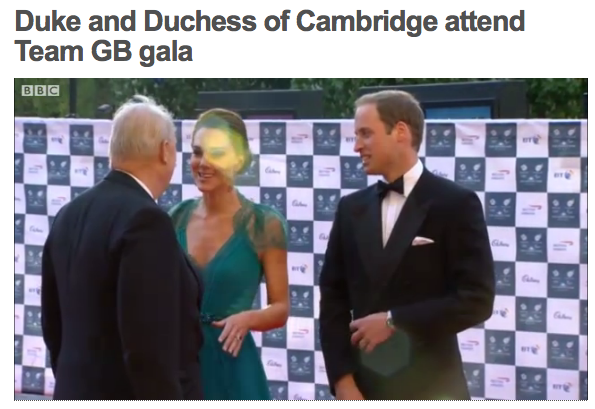 I think the problem is that Kate and William pretty much only go to gala events. They need to do more to promote charities. They act more like celebrities than like royals. They should be doing engagements at least 3 times a week and not glamorous things but rather visits to various programs and institutions. This is what Prince Charles, The Queen and Prince Philip all do. And Harry is even doing a lot more humanitarian work than Will and Kate do. Ok, but considering William has a military career in Angelsy, they may not be able to devote 3 days a week to appearances. And after the previous event (before the Olympic one)Kate was volunteering with the scouts the very next day…certainly nothing formal or gala about that. Plus, her appearances while William was in the Falklands were almost all charity events. I’m not really sure why I feel the need to defend them since I’m from the States and it really doesn’t affect me. But I certainly don’t feel they are partying too much. And for the work, I think her job is to represent her country all over the world, and she’s doing it perfectly, everybody talks about her, her dresses, her commitments etc, and she’s the best living advertisement that the UK might wish, especially after all the difficult years the royal family has been through thanks to Charles-Diana, Andrew-Sarah, partying Harry etc. Really, Kate is a bit of fresh air for them all. I think we see mostly the party side of Kate and William’s appearances because they’re more attractive for magazines, glamorous nights are easier to sell. I thought the back of the dress was stunning. The color is stunning. The front doesn’t do it for me. Also, I like an updo, but that one looks so contrived, with plaits and swirls, etc. I don’t know. She need is a stunning woman but she needs to ease up on the eye makeup. It is aging her beyond her age of 30. I shan’t comment on the shoes. Tippy, you’re 100% correct. The back is gorgeous and the color is great. Front, not good. Its just not right for her figure, IMO its too delicate a cut for her sporty figure. I think it actually just accentuates the wideness of her top half compared to her skinny legs. And the makeup is SO HARSH, as always, I don’t understand why! And the shoes, ugggh, the stripper shoes again Kate? I don’t get it! claridges dinner a few days ago combining beautiful gowns with designer paste earrings. ohhhh there ! What a splendid princess ! the dress is very classy ! 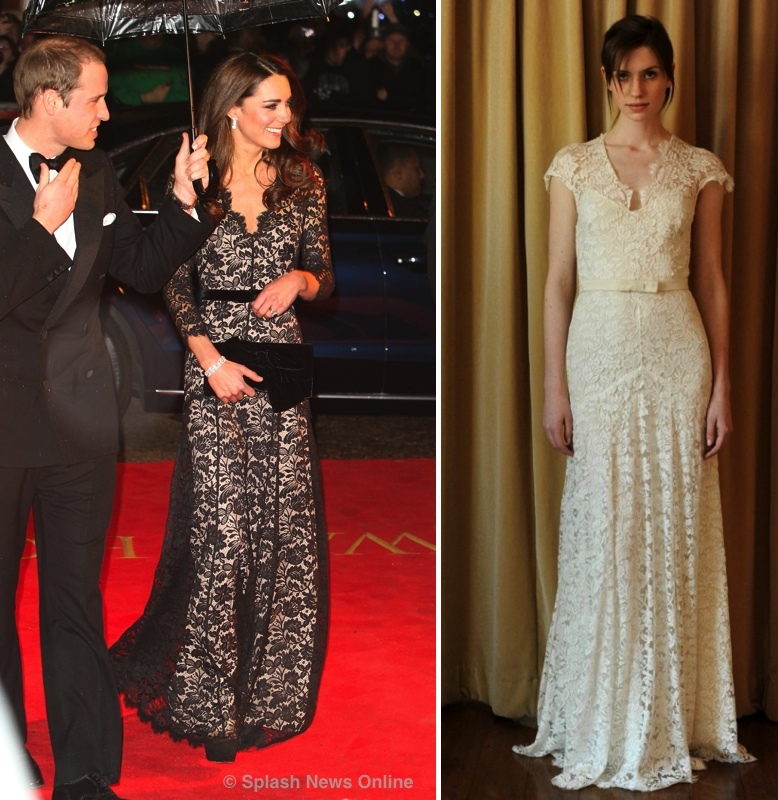 Jenny Packham is a talented stylist, the princess looks always beautiful in Packham’s dresses. Did Kate read WhatKateWore ? She has put her hair up ! Love the gown for both the color, fabrics, and beading! But I do have a question about her footwear. I thought she was supposed to pantyhose and closed toe shoes in observance of royal protocol. But two times in one week, she wears these open toed sandals sans pantyhose. Is there some loophole/exception I don’t understand? I would guess that bare legs are “acceptable” when wearing full length length dresses/evening gowns. The general view is that you don’t wear pantyhose/tights with open-toed sandals. There really is no “rule” stating that royals can’t wear open-toed shoes (the Queen wore such shoes with her wedding dress, and Princess Margaret wore them often, too), but if you’re going to be wearing pantyhose most of the time, you’ll avoid them. However, with a long evening dress, bare legs are really not going to matter, so the sandals are fine. Additional comment … the Duchess looks dangerously thin, like she’s lost more weight from the War Horse premiere. The gown tonight showed that her arms are skeletal, not just fit or thin or slender but is moving toward emaciated. It’s time the royal and British press and her fans started acknowledging that something seems to be amiss with her weight – especially those hoping and hinting for the announcement of a royal pregnancy. I actually think she’s put on a significant amount of weight since the Canada trip last summer, when she really was starting to look alarmingly thin. She looks much healthier to me right now. The pictures of her in the close-fitting gray Wakeley dress several days ago showed clearly that she’d gained some weight. I might add that that is not automatic that thin people have trouble conceiving. Plenty of models and actresses have conceived with no difficulty. Thanks, Lili, you’ve cleared up a mystery for me. I couldn’t understand why the same dress style had looked so different — the pale Wakely dress did seem looser fitting, and the dark grey was much more snug. Hadn’t thought of weight gain — not something I associate with Kate. At first I thought the two fabrics must have been different. The dark grey was almost like the woollen dress she wore to the homeless centre in London, almost as clingy. At last an updo! I guess she was holding out for a really impressive one. This is such a beautiful gown. Thank you for sharing this! I love everything about this look. She looks stunning. The first picture literally took my breath away! I love when she wears brighter colors and this is absolutely one of her best colors. The back is stunning. Her hair looks amazing up or down, but it’s nice to see some variation. Agreed, break out the crown jewels! This is an amazing gown on Kate! This has to be her #2 best fashion moment! (#1 is her wedding gown, of course). The bright color suits her. I love Jenny Packham!! This dress is stunning. The lace back and capped sleeves are gorgeous!! Jenny Packham is definately one of my favorite Kate brands. Not to mention, LK Bennett, Kiki, Pied a Terre, Links, Aquatalia, Temperley, MCQUEEN, DVF, London Sole, and etc… my list could go on and on. I just love her style. I just have to stay that this website is awesome! My mom has always been a huge Princess Diana fan so I grew up surrounded by all of her books, magazines, and television specials. It is no wonder that I became fascinated with Diana and the royal family! When Kate came along I even understood the fascination more being that same age as Kate and wanting everything she wears! Everytime my mom and I check out What Kate Wore she always says “I wish we had this for Diana when she was still alive!” Keep up that great work! Oh and to just pass along my review of the Sebago Bala and Pied a Terre Imperia– I bought both and they are wonderful! Very comfy and they go great with everything! Her color choice in this dress is not that impressive. The turqouise gown is a really pretty color on her. I think she should wear her hair like this more often! I completely agree! And I think her makeup looked great, too. This look literally took my breath away. I love lace and the back of the gown is just stunning. So elegant. Just gorgeous. I think she is very good and also the style of the earrings is nice, but seem to be the usual “costume jewelry”. I wonder if there’s a reason, besides the economic times that we live, so she almost never wears the crown jewels. She isn’t the wife of the heir to the throne, as was Diana, but the other female family members wear them routinely, especially for formal occasions. Would be appropriate for events like today. I wonder why? No one but the monarch wears the “crown jewels”. If you mean just the various tiaras and necklaces and so forth in the royal jewel collection, there really haven’t been any tiara occasions since her marriage. Moreover, she has always been very much a minimalist in her dress, choosing simple clothing designs and preferring restrained jewelry. I share that preference, so I’m just as happy not to see her dripping with jewels. And yes, I think a display of costly glitter wouldn’t go over that well at the moment. Her evening dresses attract a lot of negative comment as it is. As Lil stated the “Crown Jewels” are the crowns, and scepter, various jewelry worn only by the Monarch, during coronation, and state events. Not really, Diana and the rest of the females (minus QEII) only received a tiara from the royal collection. Most of Diana’s jewelery was from her family, and gifted to her from various middle eastern Princes, Sheik’s, and Sultan’s. Countess of Wessex, and Duchess of Cornwall, have also received crazy amounts of diamond from Sheik’s, and Kings. Every now and then they may receive a loan out, but this certainly wouldn’t be an appropriate event to bring out the bling anyways. “Routinely” is an exaggeration, the only times royals really bring out the diamonds now-a-days are, State Events, and anything White Tie (for easy reference, anything involving other royals or leaders of other countries, would be more likely to involve a White Tie dress code, ex. the State Banquet held for Obama’s visit last year), not a red carpet event for athletes, and celebs. For example, does Harry Winston Co. loan out the big diamond to celebs for every trip to David Letterman’s studios? No, only for the big night at the Oscars. Great information on this blog and great coverage of the Duchess of Cambridge’s various costumes. Glad she’s wearing all these elegant gowns and it’s nice to see some shoe recycling going on too, keeping in mind that Britain and most of the world still are suffering economically. Great details here to but PLEASE can somebody ID that toenail polish?!? It’s absolutely fantastic!! Wow — this totally tops last year’s black McQueen dress that she wore to the Military Awards. 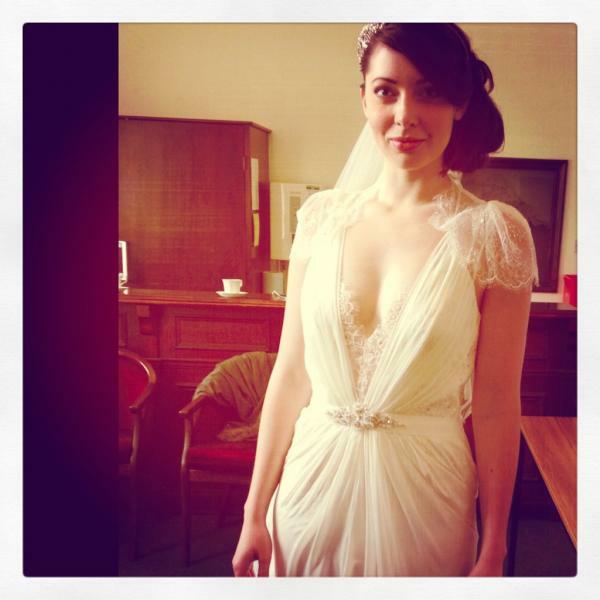 This Jenny Packham dress is stunning! Perfection! I just celebrated a big # wedding anniversary and this makes me wish I needed a wedding dress! I would adore wearing this in white. Of course, it wouldn’t hold a candle to Kate who is beautiful beyond words. Wow. Just wow. She looks like a true princess tonight! Absolutely stunning. The color, the shape, the details, the hair – she looks absolutely gorgeous! this is just PERFECTION! She looks like a princess should. The dress is exquisite, tasteful, and elegant, and that lace is gorgeous. I love the buttons and the back and the cap sleeves … and the little lace insert at the chest. The color is perfect for Kate, and I’m so happy to not only see her in an updo, but a VERY detailed one! I like especially the detailed updo in htat it matches the delicacy of the lace and crystal details of the dress. I love the hairstyle and adore the dress — especially the back + colour. But I am not fond of these shoes! Ah well. I love Paige denim (and Jenny Packham, but Paige is at least a little closer to my price range!) In fact, I’ve currently set a bit of a weight loss goal, and if I meet him, I’m treating myself to a pair of Paige Skyline Peg leg jeans!!! My favorite C-inspired brand has to be Reiss. When my husband and I randomly walked past it shortly after its opening I went in to check it out. I didn’t need anything and their clothes are a bit too expensive to just buy for fun, but my husband – who is so hard to shop with/for – immediately walked over to a stunning leather jacket, pulled it on and before I even got to the first rack bought it for himself. Meanwhile, I’d been trying to get him to try different ones for a couple of years because I always thought he’d really like having one. As I walked over to inquire how the change of mind came about, he answered: “I don’t buy clothes. Clothes buy me. And this is finally the kind of nicer store where I feel at home and clothes call my name” At least it was their summer sale and at least one person in this marriage is okay being run over by the masses at Zara before going naked. Now THAT is a princess! I absolutely love this dress too. So delicate and pretty w/ pleats. I absolutely adore Jenny Packham! I just adore when she wears her hair up. wow love it. the dress is stunning probably her best hair/dress combo yet! I really love those smoky eyes too — it’s sensational make-up. Oh my god the Duchess looked just stunning tonight. I loved the dress, shoes and the hair. and then I noticed her eyes. They are so beautiful. The eyebrows and the make made her eyes just shine. William must be very proud of his beautiful Duchess. As refreshing as it is to see her wear color and have her hair up, that dress looks so cheap and tacky. If she eased up on the war paint, it would be great. I’m sorry, but that dress is anything but regal and “stunning”. The only dress she’s ever worn that was gorgeous and perfect for royalty was the pink ARK dress. Gorgeous dress – beautiful and tasteful – and her hair looks lovely too! She looks absolutely stunning. When I first saw the dress, I was actually surprised it wasn’t in one of GB’s colors, like a midnight blue. (She’s very good at incorporating themes in her outfits.) But then I thought it may have been too obvious and would come across as trying too hard. Regardless, this is a really gorgeous color on her. For some reason, I find it amusing that many of her dresses are actually wedding dresses, albeit in jewel colors. I was thinking how she’d saved up such an eye-catching outfit to launch the whole Olympic festival in a way –it surely got the event noticed & then some! Love the intense color! A surprise after all the neutrals she’s been wearing lately. Lovely flowing style, quite a decolletage, a bit daring, perhaps, but she has the figure for it! The updo of the hair was dramatic since she usually doesn’t wear it this way. Once again, statuesque; with those shoes she must be 6′ tall! LOOOOOOOOOOVE this dress. All of it. And the bridal version is amazing as well! I love Kate’s pleated version, however. and loved her hair. best day ever! Wow, with her colored gown and hair in an updo, it’s almost like Kate’s been reading the comments here! Absolutely gorgeous look – the back of the dress is just breathtaking. Well done. Well, this is a pretty dress, if not precisely to my tastes. I find it a bit too demure, with the lace, cap sleeves, bow, and back buttons. I prefer sleeker, more sophisticated designs. However, the moment I saw it, I thought, “If it were white or ivory, it would make a nice wedding dress,” so I’m amused to find that that’s exactly what it was. The color is lovely, and of course the Duchess wears blue shades so well. I’d call it turquoise. The chignon is lovely, too, but I rather wish her hairdresser would eschew all the intricate complexities he’s been playing with lately. A very sleek, classic, Greco-Roman chignon would have worked well with the Greek peplos-like pleats of the dress, together playing off of the Olympic theme — which may, in fact, have been the idea. I thought it was more a peacock green/blue color on my screen. The sleeves look odd to me as well. I don’t care for the earrings either. I had trouble with the sleeves at first — there does seem to be something out of sync at first glance. But the way it works for me is that the lace acts like a small bolero-style cover-up — albeit fixed in place — over a dress top with thin/spaghetti straps. It’s ok, just shoot me down in flames. I actually gasped out loud when I scrolled down to the first picture, and then again when I saw the back of this dress! I think this has eclipsed the lavendar dress she wore in LA as my all-time-favorite formal gown of hers…absolutely stunning. Just adore when Kate wears her hair in an updo and this is the best hair and dress yet! She looks like a queen fantastic gorgeous and I love her colour choice. Canny, canny girl. Of course, sheâ€™s kept us waiting â€” she saves the best till sheâ€™s ready to use it, and Oh! can she turn on the style!!!! GORGEOUS!!! I love it when Kate does something unexpected. Now, if only she will wear a Tiara sometime during the Queen’s Jubilee Celebrations, my happiness will be complete. I so agree — I’ve been wondering what Kate will do when she’s expected to do the full-on bling. With this latest outfit she’s shown she could carry off a tiara with the best of them!